How cute is this big fur brother!?? We just love celebrating the older fur siblings when we deliver stork signs for new baby! 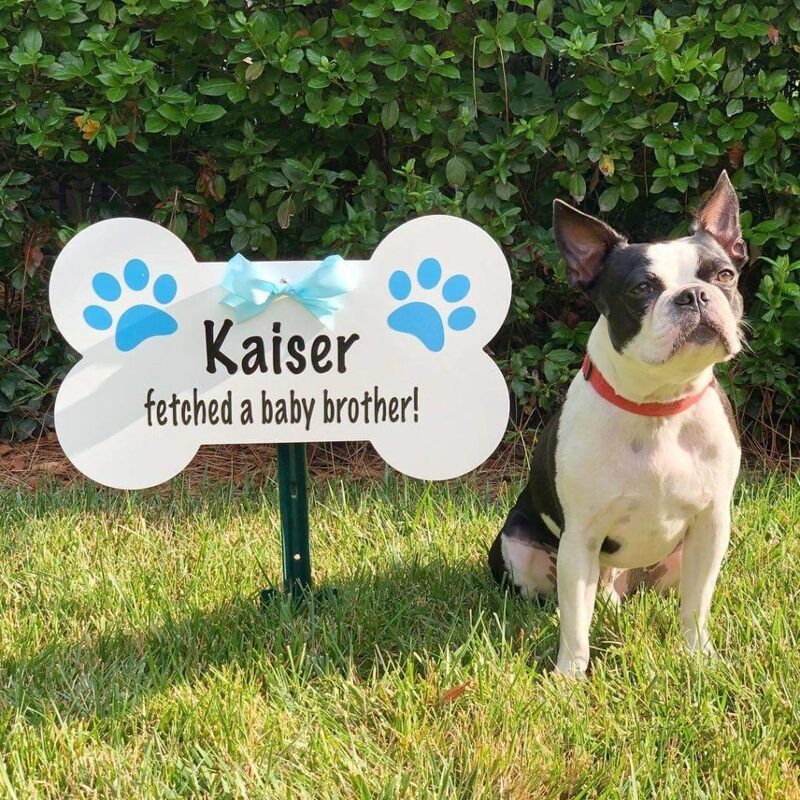 Congrats on your baby brother, Kaiser! 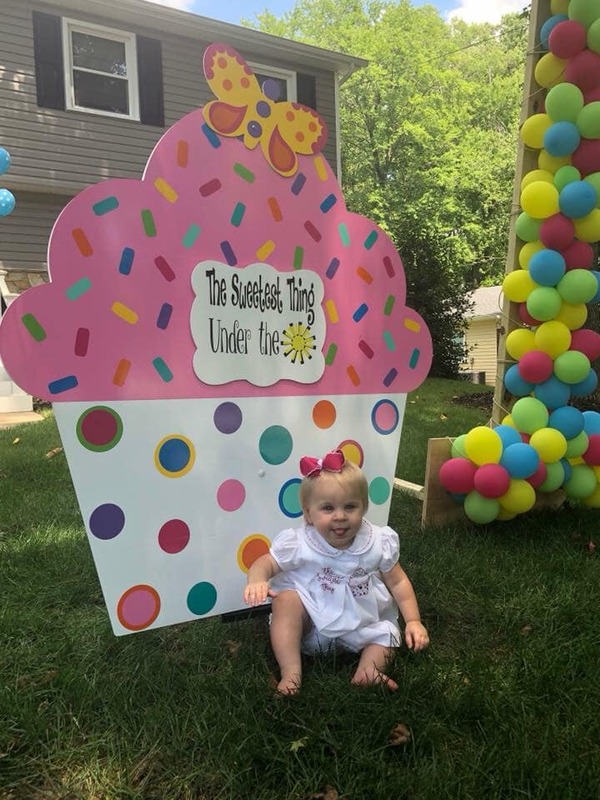 Sandhills Baby and Birthday Signs is the Southern Pines region’s most popular lawn sign rental service specializing in birthday yard card signs and newborn stork sign rentals! 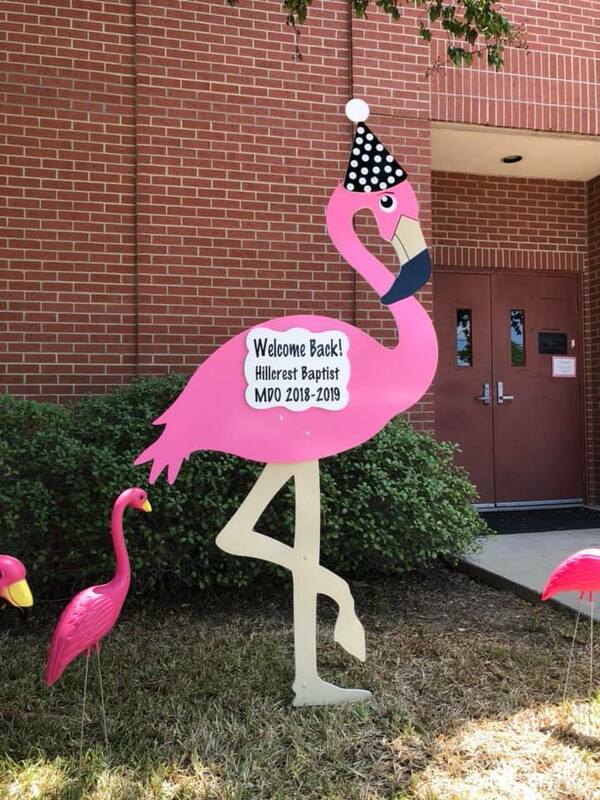 We have a beautiful variety of lawn signs to select from including birthday cupcake signs, flamingo signs, stork signs, sailboat signs and more! Let us help you celebrate the new baby girl or baby boy in your family with a classic newborn yard sign! Call us at 910-723-4784. We proudly deliver yard signs throughout Aberdeen, Fayetteville, Spring Lake, Sanford, Pittsboro, Aberdeen, Raeford, Pinehurst, Hope Mills and all neighboring towns. Follow us on Facebook, IG, and Pinterest! 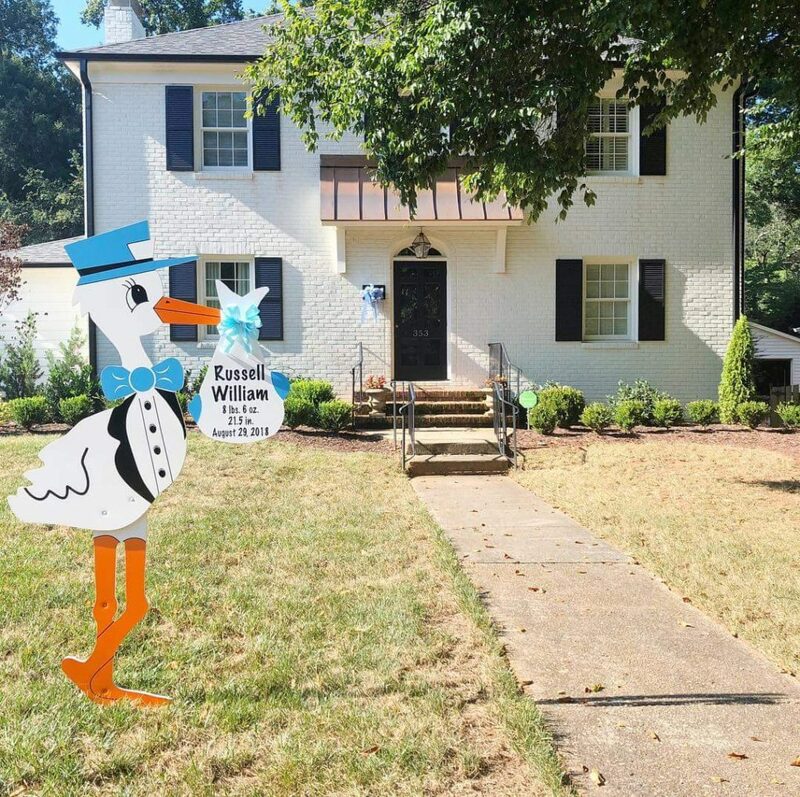 Fayetteville NC Boy Stork Sign ~ Welcome home, Russell! Sandhills Baby and Birthday Signs is Fayetteville, Sanford, Raeford and Hope Mills’ premier stork rental sign service. We also have a wide variety of personalized birthday yard signs for kids birthdays and adults as well! Choose from pink flamingos to sailboats, giant cupcakes and more! Let us help you celebrate a birthday party in Fayetteville, NC! Let us help you make your new baby’s birth announcement with a classic stork sign! Call us at 910-723-4784 or find us on social media for more pics of recent rentals! Visit us on Facebook, Instagram, and Pinterest. Apex, NC ~ Welcome home, Hallee! Stork Signs in Apex, NC are just a call away! Call Sandhills Baby and Birthday Signs at 910-723-4784 to rent a birthday yard sign or newborn stork sign in the greater Sanford area. 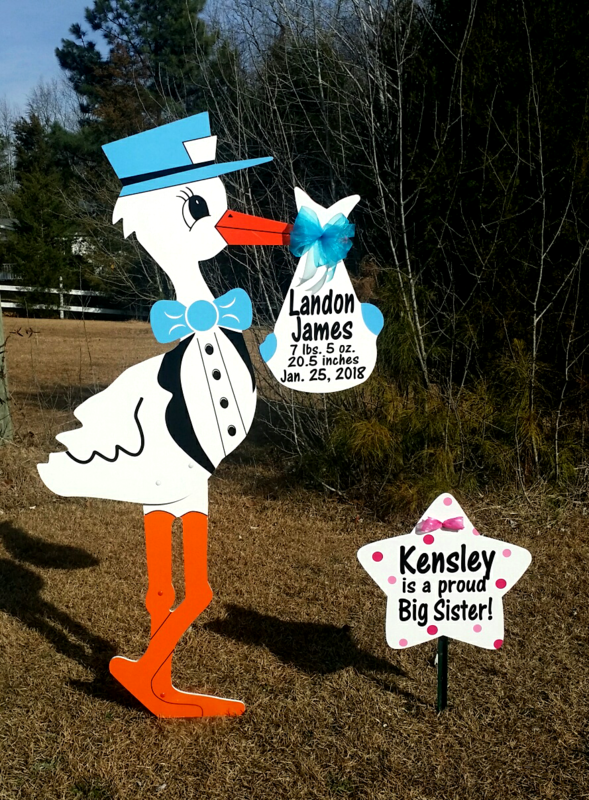 Sandhills Baby and Birthday Signs delivers newborn stork rentals and birthday signs throughout Cameron, Carthage, Pittsboro, Apex, Sanford, Southern Pines, Spring Lake, Raeford, Pinehurst, Aberdeen, Fayetteville, and nearby towns. Call us at 910-723-4784 to reserve a newborn stork birth announcement or a personalized birthday yard sign in your town. Apex, Pinehurst, Sanford and surrounding towns! Start the New Year off right!! Do you know someone with a baby on the way in 2019? Do you have someone with a birthday in the greater Pinehurst area coming up soon? 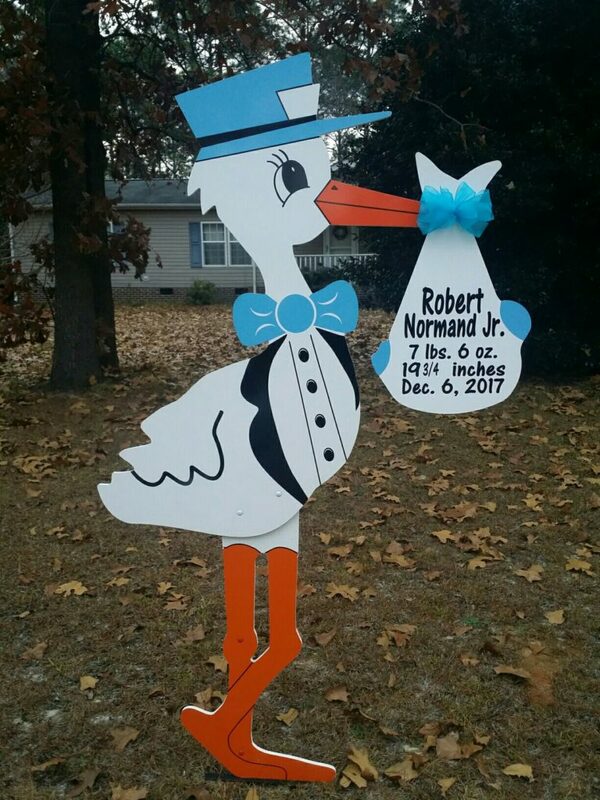 Let us help you celebrate new baby with a stork sign rental in the Fayetteville, Spring Lake, Apex, or Southern pines area in the new year! We deliver newborn storks and birthday signs throughout the Sandhills. Call us at 910-723-4784! Scroll down to check out a quick look at some of our birth announcement storks and signs! This is an example of our blue stork sign.. a modern twist on a timeless classic! Looking for something extra fun to celebrate the new baby and not digging our classic old school storks? Let us help you celebrate the new baby boy or baby girl with a modern twist! 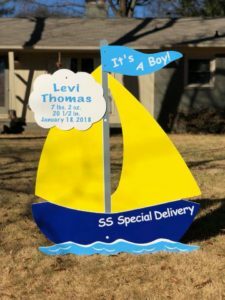 Check out our sailboat sign birth announcement and our baby carriage birth announcement yard signs! Visit us on Pinterest, FB, or instagram to see more photos of signs we rent throughout Apex, Fayetteville, Sanford and beyond! Fayetteville, NC ~ Happy 40th birthday, Susie! 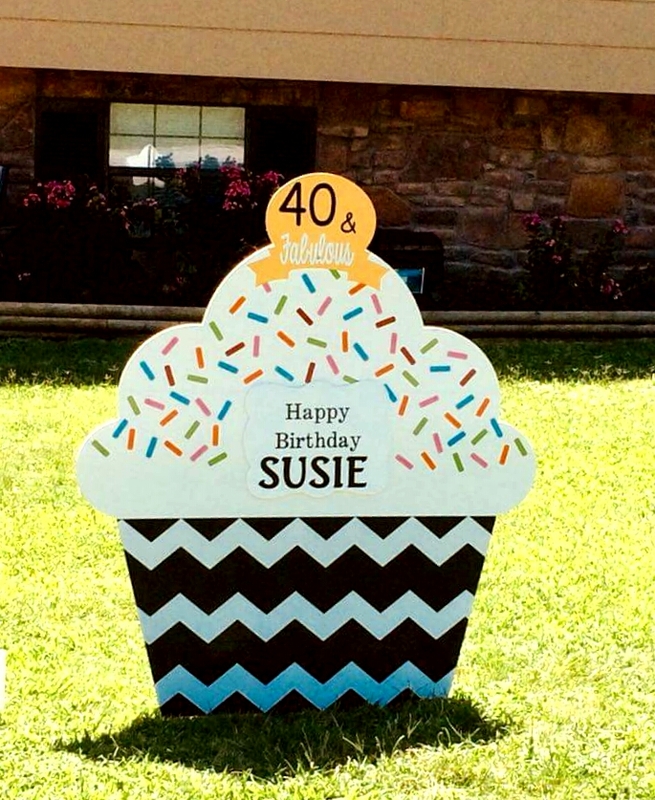 We were so happy to help you celebrate with a birthday yard sign! 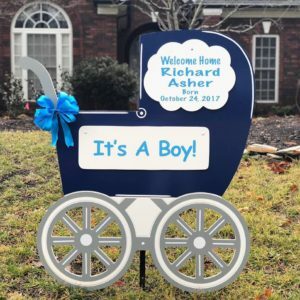 SANDHILLS BABY AND BIRTHDAY SIGNS is the Fayetteville and surrounding areas’ premier lawn sign rental service specializing in personalized birthday signs and newborn baby stork signs! Call us at 910-723-4784. We proudly deliver newborn stork rentals and birthday lawn signs throughout Sanford, Pinehurst, Apex, Fayetteville, Cameron, Hope Mills, Spring Lake, Carthage, Raeford, Pittsboro and nearby towns. Find us on pinterest, instagram, and Facebook! 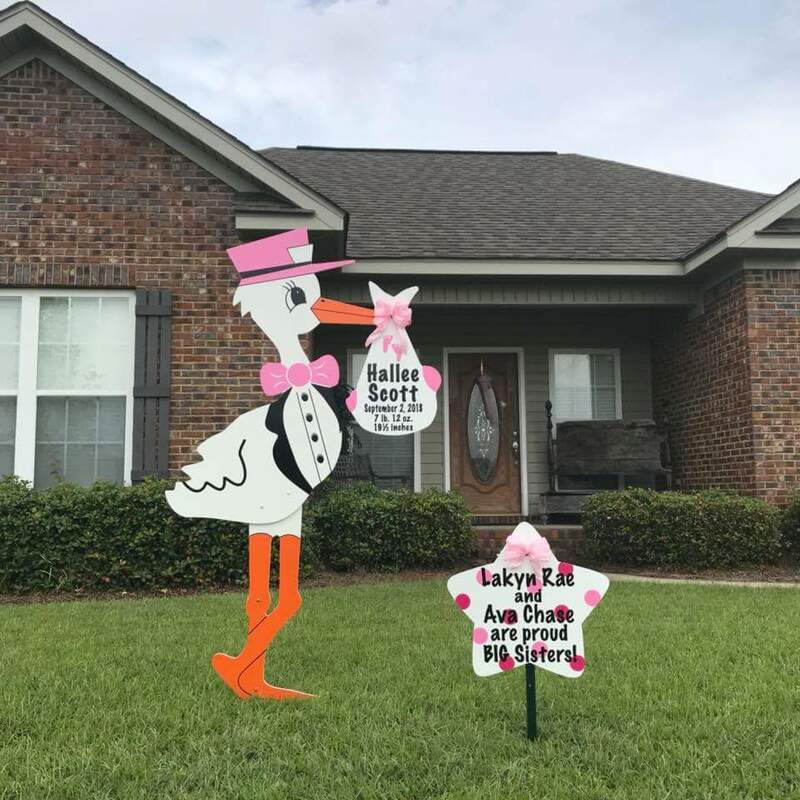 Sandhills Baby & birthday Signs is the Sandhills area’s premier lawn sign rental service specializing in newborn birth announcement storks, retirement signs, graduation signs, pool party signs, flamingo signs, baby shower signs and more! Let us help you celebrate your new baby with a stork sign rental or other birth announcement lawn sign. We also have a great variety of birthday signs to choose from including giant cupcake signs, flamingos, sailboats, and more! 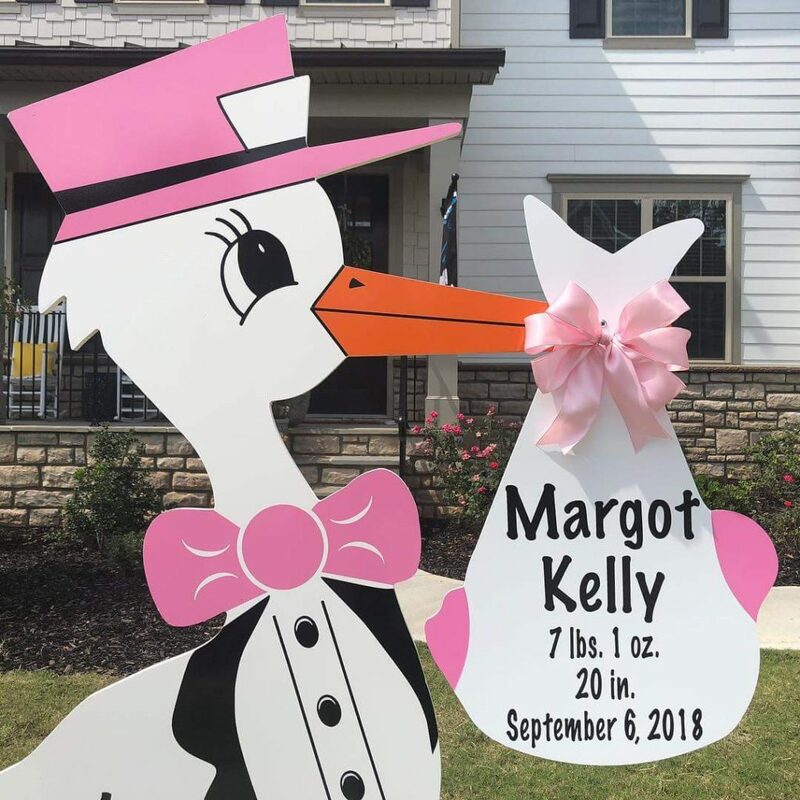 We proudly deliver newborn storks and birthday yard cards throughout Fayetteville, Raeford, Hope Mills, Sanford, Spring Lake, Pinehurst, Carthage, Parkton, Seven Lakes, West End, Cameron, Siler City, Pittsboro, Aberdeen, and all neighboring towns! Call us at 910-723-4784. 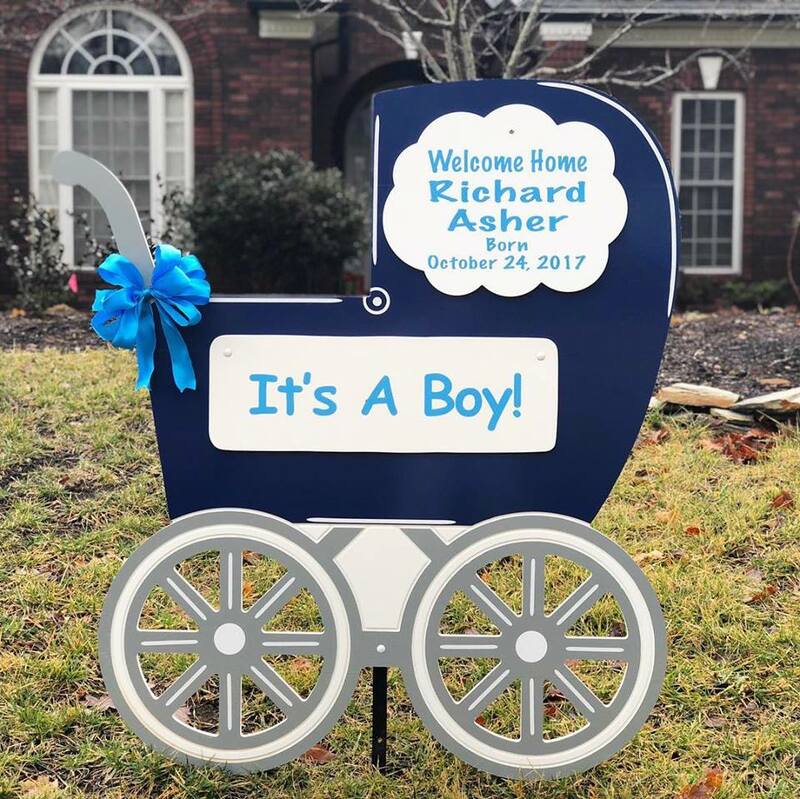 Sandhills Baby and Birthday Signs delivers birth announcement storks and birthday yard signs throughout the greater Sanford area, including Apex, Hope Mills, Aberdeen, Pinehurst, Fayetteville, Cameron, Pittsboro, Parkton, Southern Pines and all neighboring towns! Call us and let us help you celebrate a new baby with a stork sign or a birthday boy or girl with a personalized birthday yard sign like this one! Call 910-723-4784 or place orders on our website! Follow us on Facebook to see more fun pics! Southern Pines, NC ~ Thanksgiving Baby Alert! We love this time of year! Who doesn’t?! Do you know someone with a baby due soon? Is your baby boy or baby girl due around Thanksgiving?! 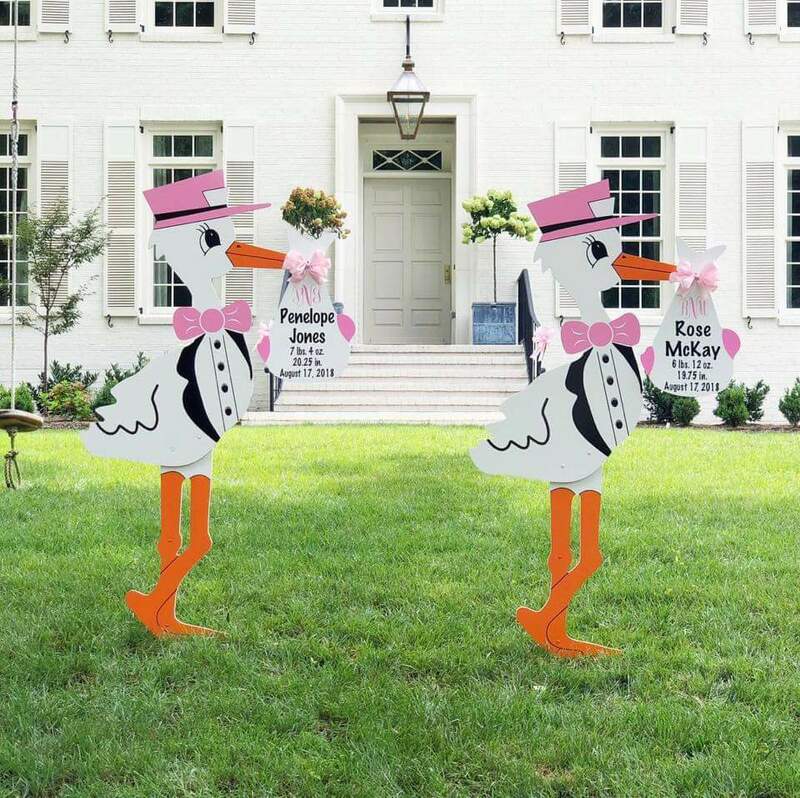 Give us a call at 910-723-4784 and let us help you celebrate with a personalized lawn stork sign for a birth announcement to all of baby’s first visitors! Call us at 910-723-4784 to have signs delivered in Apex, Fayetteville, Spring Lake, Sanford, Southern Pines, Raeford, Parkton, Cameron, Carthage, Pinehurst and all nearby towns.